I just found out about this on another blog today! It's a great way to start the day with encouragement from other Christian women who want to spend time with the Lord before they start their day. If you're like me you'd rather sleep in than get up early. I've noticed a BIG difference on days when I wake before my children and spend time reading my Bible and talking to my heavenly Father. Here's a quick description of Hello Mornings. The challenge sign up goes until January 26th. So sign up and pass the word along! You’ll get weekly emails to encourage you and give you tips and tools to make the most of your mornings. You’ll also have the chance to join a group so that you can join in a small group community to keep you motivated throughout the challenge. The challenge sign up goes until January 26th. So sign up and pass the word along! I'm excited to get started. Today I had set my alarm for 6am and then managed to sleep in til 8! I'm ready for some encouragement and accountability to start my days right. How about you? I have some exciting news to share! 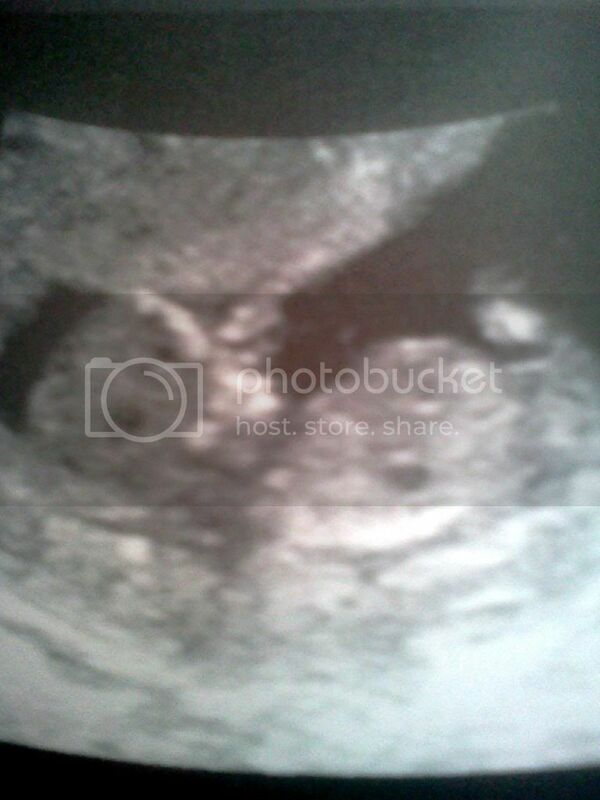 We are expecting our fourth blessing this July! My husband and children and I are all very excited about this. The children want a brother! Even though we weren't "trying" to get pregnant, God's timing is perfect. I'm sure many mothers of larger families have experienced similar reactions from families. Them judging you and not sharing your excitement no matter what the circumstances may be. It's frustrating and saddening. Babies should be a joyous time whether we planned them or not. Unfortunately the world has other opinions. Even "Christians" can see them as a burden and the parents being "irresponsible" if we are given this blessing at what others may deem an "unfortunate" timing. After expressing my sadness with a group of ladies last night I was greatly encouraged. So I'd like to do the same for any other families who are going through struggles with family over a new pregnancy. Rejoice in the Lord always, I will say it again rejoice! Even though nay sayers are trying to steal your joy, DO NOT LET THEM! Instead let them see that you will STILL rejoice in the Lord and thank him for your marvelous blessing! Remember the fruit of the spirit and be an example of those to the world around you. They will see God's power working in your life and that you are joyous no matter what life brings you. Celebrate the new life God has given your family and enjoy your pregnancy! I pray that this has been encouraging to thos who read it. I have been thinking about this since yesterday when we got some pretty negative comments when we announced our pregnancy. I refuse to let that steal my joy for this amazing blessing in our life! Hello everyone! Here with an update on my word for 2013 and how things are going with my 3 goals and diligence. 1. Bible reading. Heres the one I got for Christmas and really like! NIV and The Message Side-by-Side Bible, Large Print: Two Bible Versions Together for Study and Comparison I'm still following my You Version reading plan. I don't read every day bu if I do miss a day I make sure to catch up the next day. So far up to chapter 36 of Genesis and 10 of Psalms. I'm really enjoying reading through Genesis! I have read the stories before but haven't read them all in order like this before from creation to now Jacob and soon getting into the story of Joseph. I do need to continue to be diligent with reading and making sure that I do it daily so that's my plan for this next month for this goal. 31 Days to Clean - Having a Martha House the Mary Way . This book has a short reading for each day followed by a "Mary Challenge" which makes you think about things like your reasons for wanting an orderly home, your priorities in daily life and what your family would like you to continue or do differently. Following that there is a get up and go do it "Martha" challenge. I've cleaned out my fridge, scrubbed the cabinets and organized them etc. My goal for the coming month is to continue my way through this book! I haven't been very diligent about doing it every day but am working my way slowly through it. I would like to have itfinished by this time next month. After that it's working on keeping order in my home. 3. 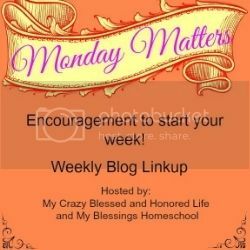 Our Home school: We got back to it last week and have finished week 19 of our school year which i posted about a few days ago! I'm glad to be back to school and enjoying the routine with my children. As for planning for next year, after much thought and stressing over math program for next year I finally figured out what I was going to do. I think God really came in here and made me realize that I've loved all of My Father's World's recommendations so far and that I should trust those recommendations. So, next year is figured out and now it's just waiting for the money to purchase K and 4th grade! There's a little of my month. How's your one word goig? Head over Only a Breath and share your update! Back at it! week 19! This past week we started back to school after a wonderfully long 4 weeks off for Christmas. I was glad to get back to our normal schedule though and dive into our school work again. Here's a reca of our week. Finished chapter 10 on fractions. YAY! Learned about adding and subtracting like fractions, parts of a set and then a review of what she had learned from the chapter.Next week we move onto more multiplication. This week's science was animals! We read from the Usborne "First Encyclopedia of Science" to learn about types of animals and their babies. We also made a Scholastic book on mother animals and their babies. On Thursday we played a matching game. There were cards with different types of animals, ie, mammals, amphibians, reptiles, birds and fish. Then there were other cards with examples of each on them. To make a match you had to find mammal and elephant for example. The younger two joined it but didn't quite understand the classifications. They still had fun though! We also checked out some fun things online about animals and their habitats. Earlier this year we use Hooked on Phonics to do some remedial work. Now reading is a LOT better! i need some kind of schedule to follow. Just pick a book and read it doesn't work for me. 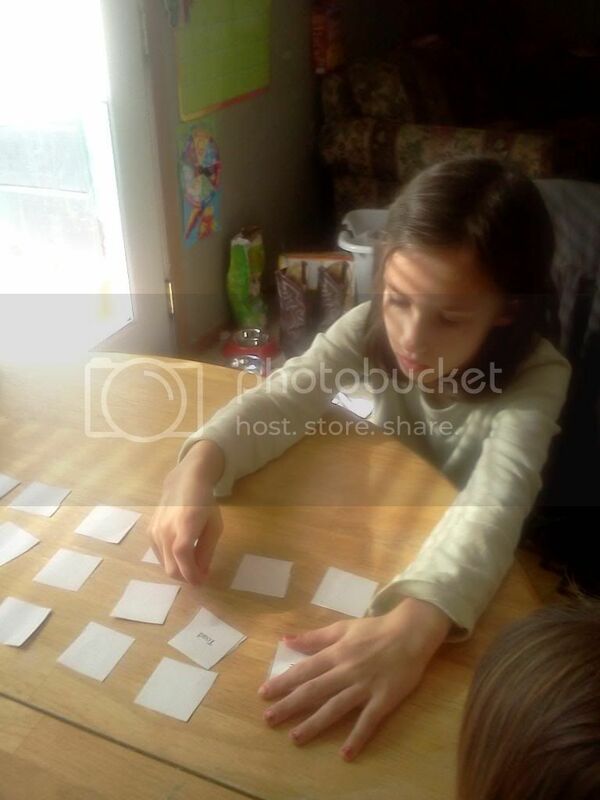 I found this great site called Lesson Pathways that has lesson plans for completely FREE! It covers all grades and subjects. We started their 3rd grade reading program and the first book was the The Boxcar Children (Boxcar Children Mysteries) . Chelsea made it through the first four chapters this week with only help on a few words! I was happy and she seemed to enjoy the book so far. Later on the program steps up the reading level to things like Stuart little and Charlotte's Web but I'm glad for an easier start to boost confidence! We made it to our state this week, OHIO! We read a story about a family going down the Ohio River to make a new home. American Pioneers and Patriots, Second Edition learned a little about johnny Appleseed, enjoyed some apples and learned some fun facts about Ohio. The funniest by far was the fact that in Cleveland you have to have a hunting license to catch a mouse! All of us were brave and tried our state drink, tomato juice. Not sure who came up with that one! The girls took a few sips before turning it down but my little Cowboy wanted nothing to do with it after one small sip. Needless to say we won't be drinking much tomato juice around here. We continued to learn about this verse for our Bible lessons this week and found passages throughout the Bible that point to Jesus as the Lamb of God. 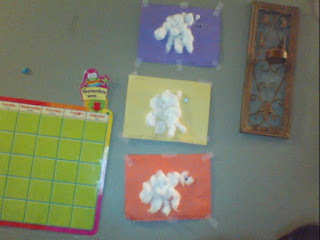 On Thursday we used mommy's hand to trace and cover with cotton balls for sheep! I posted earlier this week about my 2013 goals. Then this morning I saw on another blog a post about One Word buttons. The idea is this. Pick one word that you want to use to describe your goals for this year. After thinking about my 3 goals I posted earlier I realized they all had 1 thing in common. 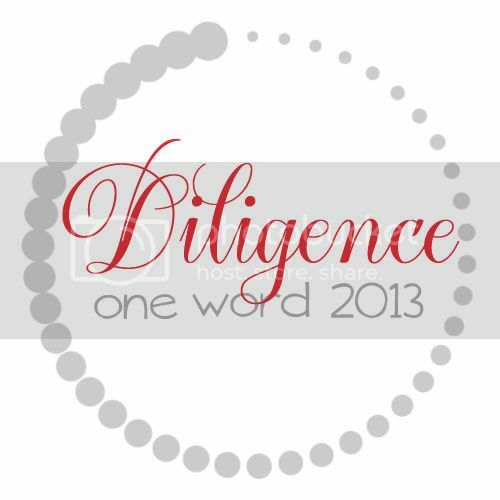 DILIGENCE! For me to accomplish any of them I'm going to have to be diligent in doing them and working on them daily. So this is my one word to describe 2013 for me. To be diligent in keeping up with and organizing my household. Diligently reading my Bible daily so that I can read the entire thing this year. Thirdly diligently teaching and training my children whether it be for school or everyday life. If you would like to get your own One Word button visit Only A Breath or email Melanie@onlyabreath.com and tell her what your 1 word is, whether you want the black or white version of the button and a link to your blog. She got mine to me within minutes! Then add your button to your sidebar and introduce your word to your readers as a reminder and encouragement to remember your goals for 2013. Don't forget to link up with Only A Breath and feel free to share your One Word here on my page! Happy new year everyone! I hope 2012 brought you some good times with the ones you love. For me I'm sort of glad to see a new year come. Last year was rather rough for our family and I'm ready for a new beginning! I don't really make "resolutions" for the new year but I do have a few goals that I want to accomplish this year. 1. I got a new Bible for Christmas! It's larger print which will be great for me. My goal for this year is to read the entire thing. My husband inspired me to do this. He has been faithfully reading daily and has almost read the entire Bible. Then we gave my Dad a Bible for Christmas. When we talked on the phone later he said he never really had one which made me happy that he FINALLY had God's word. Then came the humbling part. He asked ME if I've ever read the whole thing. I had to tell him no, I hadn't and in fact in 2012 I wasn't very diligent about reading. So, my goal for 2013 is to read through my Bible. To keep me accountable I've asked my Mom to join me. We gave her a Bible for Christmas too. She is a believer but just starting to return to the Lord. So to keep each other on track and give encouragement I asked her to read her Bible this year too! 2. I NEED to get my house in order.. Earlier in 2012 I started chores with my 3 blessings. It went well for a while with no complaints. Then after a while the fun wore off and the complaints started. I got lazy about it and stopped requiring them to choose their two jobs each day. After several months of no chores my house shows it. Therefore today we have reinstated our two jobs a day plus bedroom checks at lunch time. Other than that I am going to figure out a system that works for me to keep up on things better as far as cleaning and laundry. I know my husband would appreciate it as would the children. 3. 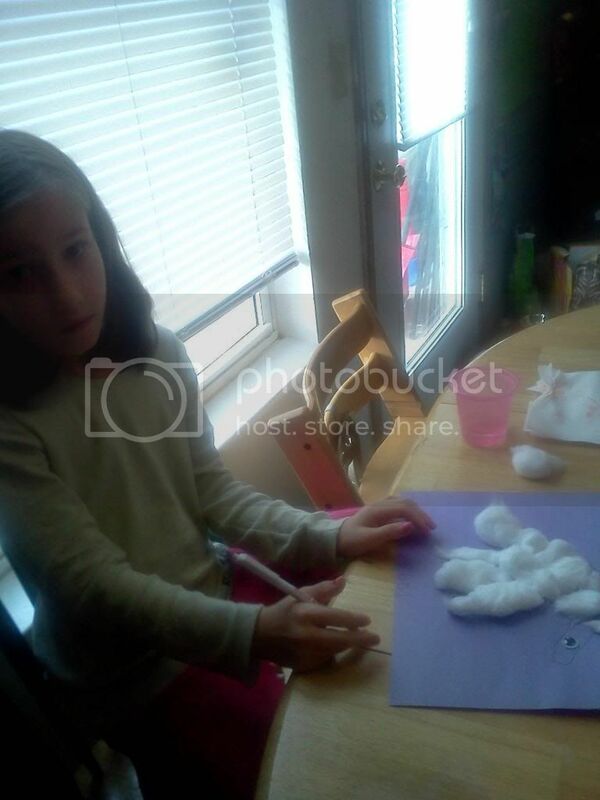 This spring I will be finishing our third year of homeschooling! It's been an adventure these past few years! I remember just starting and being SO scared and nervous! Now we've finally found the right curriculum and absolutely LOVE My Father's World. After we finish this spring we'll be starting Exploring Countries and Cultures for fourth grade AND adding my son in for kindergarten! I didn't teach my oldest to read because she went to public school for kindergarten.I'm a little nervous about teaching two children now but at the same time quite excited. I know my son will pick up on things quickly. He loves learning and and always surprises me with what he knows! Goal number three is to finish out this year of school and make our next year a successful one. These are some of my goals for 2013. What are some of yours? What are you putting in place to achieve them? will update soon with fun from our Christmas vacation! Have a blessed 2013!